Add-ons launcher tab got a new look. 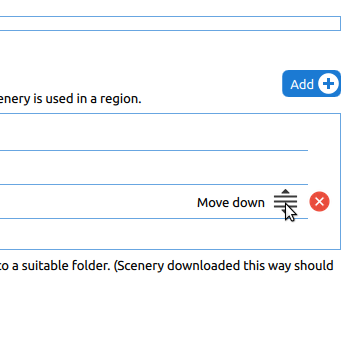 I tried to reorder my Custom scenery folders. So I hover the mouse over the right side of the list, then button appears. I thought I need to press and hold left mouse button on it and move mouse up or down. But instead of one line changing its position on the list my whole screen is being scrolled up or down. How do I change folders order? I know I can delete records one by one and add them in my desired order but I don't think it is the way it should be done. I'm wondering.... It seems that it does not work for "Additional scenery folders". On "Additional aircraft folders", it works merely by left-clicking on "Move up" or "Move down". Probably correct. You will see this list, comma-separated, in the order. Maybe just changing the order in the file and save? (make a backup before just in case...). For me, it works. The Launcher was closed before and during doing this change.